TDS threshold on interest on bank and post office deposits raised from ten thousand to forty thousand. Package of ₹6000 every year for farmers with lower than 2 hectares of land. Scheme to be referred to as Pradhan Mantri Kisan Samman Nidhi. Anti-camcord regulations to be launched within the Indian Cinematograph Act to prevent piracy and contact theft of Bollywood movies. 25 per cent of sourcing for government projects might be from the MSMEs, of which three per cent might be from women entrepreneurs. ESI cover limit elevated to ₹ 21,000. Minimum pension additionally elevated to ₹ 1000. Mega pension scheme for workers within the organised sector with an income of lower than ₹15,000. They’ll be capable to earn ₹ 3000 after the Age of 60. The scheme might be referred to as Pradhan Mantri Shramyogi Maan Dhan Yojana. Two percent interest subvention for farmers pursuing animal and poultry husbandry. New Scheme namely “Pradhan Mantri Kisan Samman Nidhi (PM-KISAN)” to extend direct income support at the rate of six thousand rupees per year to farmer families, having cultivable land unto 2 hectares is announced. Under this Government of India funded Scheme, Rs. Two thousand eaches will be transferred to the bank accounts of around 12 crore Small and Marginal farmer families, in three equal installments. This programme would be made effective from 1st December 2018 and the first installment for the period unto 31st March 2019 would be paid during this year itself, Shri Piyush Goyal said. To provide sustained and major focused attention towards development of Fisheries, the Government has decided to create a separate Department of Fisheries. Finance Minister said that through the measure, the Government wants to promote further growth over seven percent to promote livelihood of about 1.45 crore people dependent on the sector. The Finance Minister announced two percent interest subvention to the farmers pursuing the activities of animal husbandry and fisheries, who avail loan through Kisan Credit Card. Further, in case of timely repayment of the loan, they will also get an additional three percent interest subvention. Allocation of Rs.750 crores for Rashtriya Gokul Mission has been preached for the current year itself. Setting up of “Rashtriya Kamdhenu Aayog” to upscale sustainable genetic growth of cow resources and to enhance production and productivity of cows has also been announced. The Aayog will also look after effective implementation of laws and welfare schemes for cow protection. To provide pensionary benefits to at least ten crore labourers and workers in the unorganised sector a new Scheme called ‘Pradhan Mantri Shram-Yogi Maandhan’ is announced. The Finance Minister said that within next 5 years it would be one of the largest pension schemes of the world. A sum of Rs. Five hundred crores has been allocated for the Scheme. Additional funds will be provided as per needed, Shri Goyal added. The scheme will also be implemented from the current year 2019, he said. Individual taxpayers whos having taxable annual income up to Rs. five lakhs will not be required to pay any kind of income tax. The Finance Minister said that persons having total income up to Rs. 6.50 lakhs are not required to pay any kind of income tax if they make investments in provident funds, specified savings and. Insurance, etc. Additional elimination such as interest on home loan up to Rs. Two lakhs, interests on education loans, National Pension Scheme contributions, medical insurances and medical expenditures on senior citizens, etc., are also provided for in the Interim Budget 2019-20. Thus tax benefit of Rs. 18,500 crores is proposed to be provided to an estimated three crore middle class and small taxpayers comprising self-employed, small business, small traders, salary earners, pensioners and senior citizens. For the salaried persons, Standard Deduction is being raised from the current Rs. Forty to Rs.50,000. This will provide additional tax benefit of Rs. Four thousand and seven hundred crore to more than 3 crore salary earners and pensioners. Escape on levy of income tax on notional rent on a second self-occupied house is also now proposed. Now, income tax on notional rent is payable if one has more than one self-occupied house. TDS threshold on interest earned on bank and post office deposits is being moved from Rs. Ten thousandths Rs. Forty thousand. TDS threshold for mutilation of tax on rent is proposed to be increased from Rs. 1,80,000 to Rs.2,40,000 for providing relief to small taxpayers. The Finance Minister Arun Jaitley says that the Government wants the GST burden on home buyers to be reduced and accordingly the GST Council was moved to appoint a Group of Ministers to examine and make recommendations in this regard at the immediately. He said that soon, businesses comprising over 90% of GST payers will be allowed to file quarterly return. The Finance Minister Arun Jaitley said that the Government had been successful in bringing down average inflation to 4.6 percent over last five years, which is lower than the inflation during the tenure of any other Government. In fact Inflation in December 2018 was down to 2.19 percent only. Shri Goyal said if we had not controlled inflation, our families would have been spending around 35-40 percent more today on basic necessities such as food, travel, consumer durables, housing, etc. The average rate of inflation during previous five years 2009-2014 was a backbreaking 10.1percent, he pointed out. The fiscal deficit has been brought down to 3.4 percent in 2018-19 RE from the high of almost 6 percent seven years ago, the Finance Minister mentioned. He said, the Current Account Deficit (CAD), against a high of 5.6% six years ago, is likely to be only 2.5 percent of GDP this year. 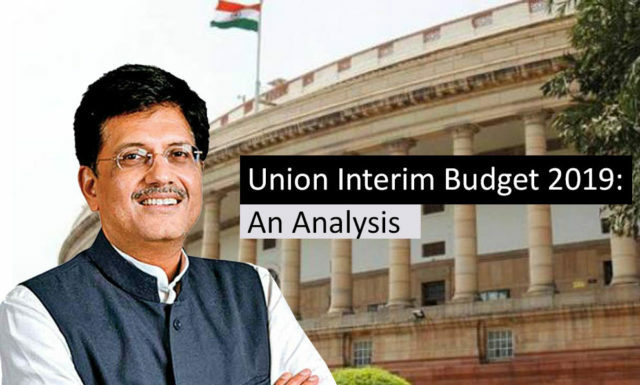 We contained the fiscal deficit notwithstanding the Finance Commission’s recommendations increasing the share of the States from 32 percent to 42 percent in central taxes, which we accepted in the true spirit of cooperative federalism, thereby transferring significantly higher amounts to the States, Goyal said. The Finance Minister Piyush Goyal stated that a stage for high growth in decades to come, had now set, after a wave of next generation path breaking structural reforms over the last 5 years, including introduction of Goods and Services Tax (GST) and other taxation reforms. This country witnessed its best phase of macro-economic stability during the last five years. We are the fastest growing major economy in the globe with an annual average GDP growth during last five years higher than the growth achieved by any Government since economic reforms began in 1991. From being the 11th largest economy in the universe in 2013-14, we are today the 6th largest in the world, the Finance Minister asserted in his Opening Remarks of his Budget speech. He said that due to such a stable and predictable regulatory regime, growing economy and strong fundamentals, India could attract massive amount of as much as $239 billion of Foreign Direct Investment (FDI) during the last 5 years, when most of the FDI was allowed to come in through the motile route. Announcing an allocation of Rs.Sixty thousand crores for MGNREGA for Budget Estimates 2019-20, the Finance Minister said that additional allocations will be made, if required. Pradhan Mantri Gram Sadak Yojana (PMGSY) is being allocated Rs.nine thousand crore in BE 2019-20 as against Rs.15,500 crore in RE 2018-19. During the period 2014-18, a total number of 1.53 crore houses have been tooled under the Pradhan Mantri Awas Yojana, he announced. By March, 2019, all families will be provided with electricity connection. Till now, 143 crore LED bulbs have been already provided in a mission mode which has resulted in saving of Rs.50,000 crores for the poor and middle class. which would have otherwise cost them Rs. Three thousand crores. Thousands of poor and middle-class people are also benefiting from reduction in the prices of essential medicines, cardiac stents and knee implants, and availability of medicines at affordable prices through to people Pradhan Mantri Jan Aushadhi Kendras, the Finance Minister added. He also said that 14 of the 21 AIIMS operating or being established in the country presently have been announced since 2014. He also announced the setting up of a new – the twenty-second AIIMS in Haryana. Divide for Integrated Child Development Scheme (ICDS) is being increased from Rs.23,357 crores in RE 2018-19 to Rs.27,584 crores in BE 2019-20. A substantial rise is proposed in the allocation for welfare of the Scheduled Castes and Scheduled Tribes. The allocation of Rs.56,619 crores made in BE of 2018-19 for SC, further increased to Rs.62,474 crores in RE is proposed to be enhanced to Rs.76,801 crores in BE for 2019-20, an grow of 35.6% over BE of 2018-19. For the ST’s also, proposed allocation in 2019-20 BE is Rs.50,086 crore as against Rs.39,135 crores in BE 2018-19, an increase of 28%. The Finance Minister Arun Jaitley said that a Welfare Development Board to frame special strategies for the benefit of the hard-to-reach Denotified, Nomadic and Seminomadic communities would set up under the Ministry of Social Justice and Empowerment. He also said that a Committee under NITI Aayog would also set up to complete the task of identifying Denotified, Nomadic and Seminomadic communities not yet formally classified. He said under the Ujjwala Yojana aiming delivery of eight crores free LP connections, more than six crore connections have already been given and the remaining will get free gas connections by next year. The Finance Minister decleard that a National Artificial Intelligence Portal will also be developed soon as a part of the National Programme on Artificial Intelligence. The Department of Industrial Policy and Promotion (DIPP) will now be renamed as the Department for Promotion of Industries and Internal Trade. The Finance Minister Arun Jaitley stated that the Government e-marketplace (GeM), created by the present Government two years ago, resulted in average savings of 25-28% and the platform will now be extended to all CPSEs. Transactions of over Rs. 17,500 crores have taken place so far. The Finance Minister Arun Jaitley announced that for the first time, the country’s Defence Budget will be of over Rs. Three lakh crore. The Finance Minister, Piyush Goyal pointed-out that domestic air traffic passengers have doubled during the last five years, leading to large number of jobs also being created. The number of operational airports has crossed hundred with the commissioning of the Pakyong airport in Sikkim. Arunachal Pradesh (AP) came on the air map recently and Meghalaya, Tripura and Mizoram have come on India’s rail map for the first time. Rs. 1,58,658 crores. The Finance Minister, who is also holding the portfolio of Railway Ministry, also announced that the Operating Ratio is expected to improve from 98.4% in 2017-18 to 96.2% in 2018-19 (RE) and further to ninety-five percent in 2019-20 (BE). Our county installed solar generation capacity has grown over 10 times in last five years. Stating this, Shri Goyal said that our commitment to promote renewable energy is reflected in setting up the International Solar Alliance, the first treaty based international inter-governmental organisation headquartered in India. This sector is now creating many lakhs of new age jobs he added. The Finance Minister announced that in Entertainment and media industry, which is a major employment generator, regulatory provisions will now rely more on self-declarations. To promote entertainment and media industry, the Single window clearance for ease of shooting films, now available only to foreigners, will also be made available to Indian filmmakers. We will also introduce anti-camcording provisions in the Cinematograph Act for media industry to control the menace of piracy he said. Saying that We are poised to become a 5 Trillion Dollar Economy in the next five years and aspire to become a Ten Trillion Dollar Economy in the next 8 years thereafter Piyush Goyal said that there has been a Growth of 18% in Direct Tax Collections in 2017-18 and increase in tax base by as many as 1.06 crore people filing income tax returns for the first time in history in FY 2017-18, mainly on account of demonetization. The Minister said that he was proposing, through the Finance Bill, necessary amendments to levy Stamp duties on one instrument relating to one transaction and get collected at one place through the Stock Exchanges. The duty so collected will. Be shared with the State Governments seamlessly on the basis of the domicile of buying client, he said. In all the complete expenditure is to increase from Rs.24,57,235 crores in 2018-19 RE to Rs.27,84,200 crores in 2019-20 BE. A rise of Rs.3,26,965 crores or approximately 13.30%. This reflects a high increment considering low inflation. The fiscal shortage of the year 2019-20 is estimated to be 3.4% of GDP. The Finance Minister Arun Jaitley pointed out that after completion of the fiscal deficit consolidation programme, the Government would now focus on loan consolidation. He said We had maintained the glide path towards our target of three percent of the fiscal deficit to be achieved by 2020-21. India’s loan to GDP ratio was 46.5% in the year 2017-18. The FRBM Act prescribes that the loan to GDP ratio of the Government of India should be brought down to forty percent by 2024-25. Along with completion of the fiscal shortage consolidation programme, we will now focus on Debt consolidation he added.